Following President Trump’s scrapping of the Iran nuclear deal and his imposition of sanctions, Boeing’s prospective $9.5 billion jet sale to Iran is finished for the foreseeable future. For Boeing, it’s a lost opportunity rather than a blow to current plans. 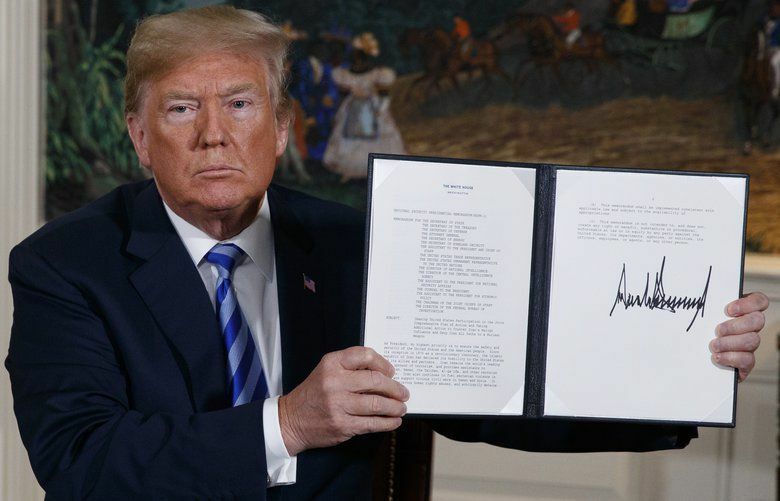 Following President Donald Trump’s scrapping of the Iran nuclear deal Tuesday and his imposition of what he called “powerful” sanctions, Boeing’s prospective sale to Iran of jets worth $9.5 billion is effectively dead for the foreseeable future. For Boeing, it’s a lost opportunity rather than a blow to current plans. Two Iranian deals for 110 aircraft got the go-ahead in the waning days of President Barack Obama’s administration in 2016. But given Trump’s hawkish views on Iran before he took office, Boeing always saw the deals as tenuous. It has not delivered any airplanes and never firmly booked the orders. The potential sales were an order from Iran Air for 50 single-aisle 737 MAX 8s, 15 large current model 777-300ER widebody jets and 15 next-generation 777-9X widebodies, plus an order from Iran Aseman Airlines for 30 MAXs. At list prices, those are valued at just shy of $20 billion. However, according to market pricing data from aircraft-valuation consultancy Avitas, the true value after standard industry discounts is about $9.5 billion. While the 777 and 777X orders in particular would have been very welcome to help sustain Boeing’s 777 production rate in Everett and to bolster prospects for the new 777X, chairman and chief executive Dennis Muilenburg said last month that production plans would be unaffected if the Iran deal were killed. In contrast, rival European jet maker Airbus, which won orders for 98 aircraft worth about $8.4 billion from Iran, formally added those sales to its order book and rushed to deliver the first airplanes as soon as it was legal. 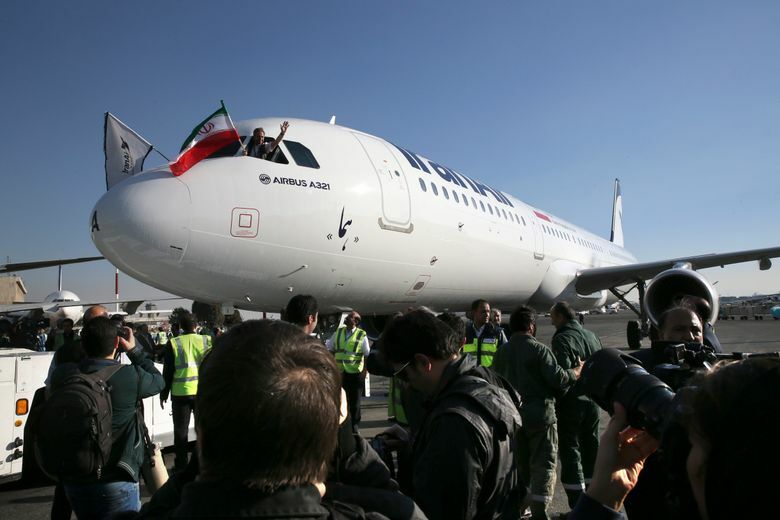 Since the deal was cleared, Airbus has delivered three jets, one A321 and two leased A330s, to Iran. But Airbus likely won’t be able to take further competitive advantage. U.S. sanctions will probably bar further deliveries of Airbus planes to Iran because all of the jets contain a significant amount of U.S. parts. The U.S. Treasury Department, which controls licensing of exports, said the United States after a 90-day wind-down period will no longer allow the export of commercial passenger aircraft or parts to Iran. U.S. Treasury Secretary Steve Mnuchin said Tuesday that the licenses granted to Airbus and Boeing under the original Iran deal will be revoked. While the Airbus deal is not necessarily totally dead, prospects for filling it are “not great,” he said. Longer term, looking ahead to when Iran may one day be free to trade without restrictions, Bloomberg Intelligence analyst George Ferguson said it’s possible Airbus would benefit from Europe’s less fraught relationship with Iran. Industry sources say some of the larger airlines that have ordered the new model 777X are seeking deferrals of the initial deliveries. Aboulafia said it now looks like it will take a long time for the 777X to get close to the 2016 production rate on the 777, of 100 airplanes per year. A slower-than-expected introduction of the 777X will also extend the slots that need to be filled with the current model 777. So, despite Muilenburg’s assurances, Teal Group now projects 777 production going even lower, from 3.5 deliveries per month now down to 3 per month. Even if the Iran sales had happened, Aboulafia said, they wouldn’t have significantly changed that outlook. Information in this article, published May 8, 2018, was corrected a couple of hours after it was posted online. A previous version of the story omitted mention of the jet sale to Aseman Iran Airlines and so gave an incorrect figure for the total value to Boeing of the potential deals with Iran.